Hardwood flooring is an investment that can last a lifetime. However, it needs tender loving care. You can preserve both your hardwood finish and the floor itself by cleaning them properly. Many homeowners opt to clean with vinegar, especially people who have babies and pets. While vinegar is a good, and green, substance for cleaning laminate or tile floors, it can strip the poly or wax coating from a wood floor. So how to clean wood floors in a way that's safe for the material, but gets the job done right? See what the pros have to say. The editors of Hardwood Floors, the journal of the National Wood Flooring Association, offered expert advice to a flooring contractor who wrote in, asking how to clean wood floor for his clients. Their answer points to the fact that not all wood floors are the same; each type of wood flooring should be cleaned in its own way. For instance, with factory-finished wood flooring and many on-site finished floors, you should avoid excessive water and steam. Carefully follow the the manufacturer's recommendation on how to clean these wood floors to keep your warranty valid. 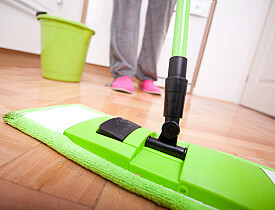 While Hardwood Floors magazine advises using cleaning agents that are labeled for hardwood floor use, they say that even such products can damage the floor. What to use instead? A Baltimore flooring contractor suggests sweeping the floor daily, and vacuuming with a soft brush attachment; then mop with a "damp dry mop," (moistened with water only) and remove all water from the floor with a towel immediately afterward. Essentially, cleaning a hardwood floor by sweeping, vacuuming, and only mopping with water is how to ensure the longevity of the finish. And that's good news for people who are concerned about the toxicity of cleaning solutions...you shouldn't use them on your hardwood flooring anyway. Protect your floors with area rugs and felt furniture "feet." Sweep daily with a soft, fine-bristle broom. Vacuum once or twice a week with a brush attachment. Canister vacuums with special bare floor attachments are best. Wax and buff your hardwood floors periodically. If you have strong, direct sunlight on your floor, close curtains and blinds or add sheer drapes to protect your floor from the intense UV rays, which can discolor it.